on the bicycle of paul barbier, designed by himself anda. faure, we have noted many very interesting details, showing a level of concern for detail seldom equalled. 1: the taillight is crimped into a small depression in the mavic mudguard. the fender stays do not have any external washers. 2: the novi dynamo is arranged such that the wire is never seen, passing through the mount and the seatstay. 3: this wire, always invisible, goes from the seatstay to the chainstay, passing through a countersunk portion of the dropout (see inset). 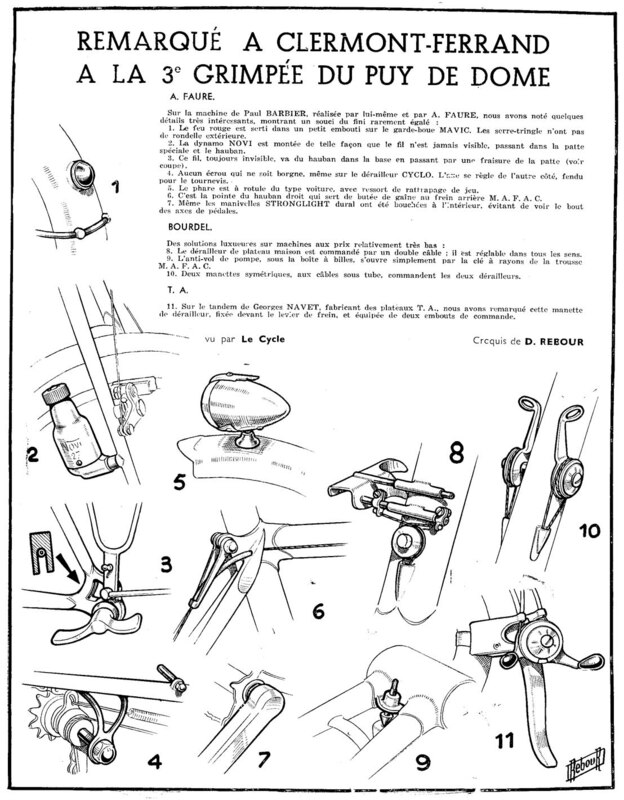 4: there are no screws which are not recessed, even on the cyclo derailleur. the pivot is adjusted from the other direction, with a screwdriver. 5: the headlight is mounted on a pedestal, with a spring to take up shock. 6: the point of the right seatstay serves as housing stop for the mafac rear brake. 7: even on the aluminum stronglight cranks the inside is blocked off, preventing view of the pedal spindles. luxury solutions on bicycles of relatively low price. 8: the house-made front derailluer is controlled by a double cable : it is adjustable in all directions. 9: the anti-theft pump peg, mounted under the bottom bracket, opens simply with a key from the mafac toolkit. 10: two symettrical levers, with internal cables, control the two derailleurs. 11: on the tandem of georges navet, maker of t.a. chainwheels, we have noticed this shift lever, attached on top of the brake lever, equipped with two lever ends.